Franklin Police Officer Dwayne Burress has been named Officer of the Month. The honor follows his work that led to the identification and arrest of two serial vandalism suspects. Officer Burress developed information on two suspects, charging an adult and a juvenile with Felony Vandalism after Downtown Franklin had been plagued by graffiti. Seven locations, including a downtown church, were affected and damage is estimated in the thousands. Additional charges are expected. Toyota – Cool Springs, and Franklin Chrysler, Dodge, Jeep, Ram are proud sponsors of the Department’s Officer of the Month Program. 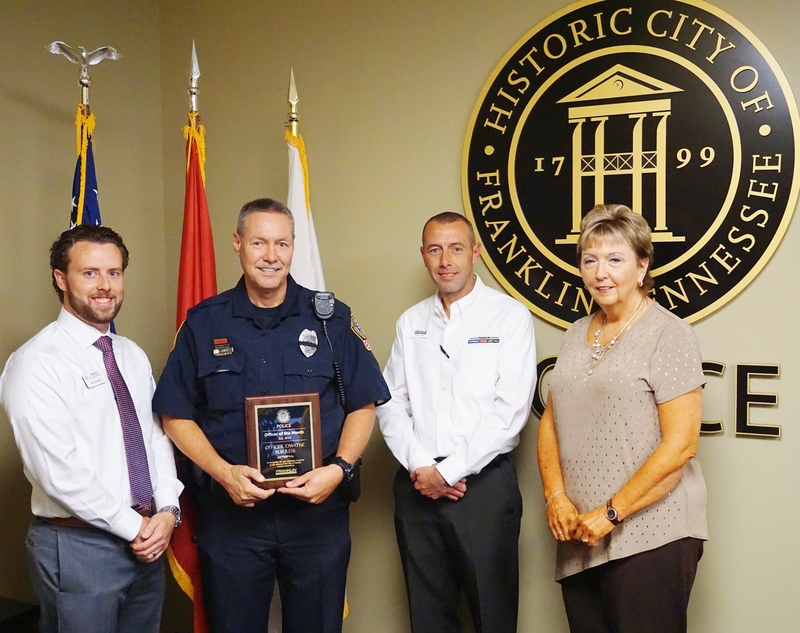 Each month they honor a Franklin Police Officer’s accomplishment with a commemorative plaque, and a $150 check for the officer to donate to the charity of their choice. Officer Burress is donating the money to his favorite charity: Concerns of Police Survivors, a national origination that provides resources to the loved ones of police officers killed in the line of duty.